Iron is one of the most abundant and cheap materials available for the construction of weapons and heavy armor in Morrowind and the rest of Tamriel. Unfortunately it has a heavy weight and bends easily which produces generally poor to medium quality wares. 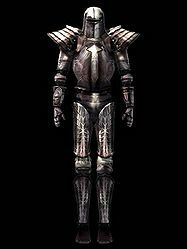 Nords have their own iron armor, Nordic Iron Armor, which is documented with the other Nordic-style armors. * Not actually found in-game, but can be recognized as the base item for the Fork of Horripilation. This page was last modified on 16 May 2014, at 16:14.